Harley's is all the way up in Minnesota! Home >	Blog >	Harley's is all the way up in Minnesota! Traveling through different states working for different pipeline companies, cooking or just attending an out of state wedding one thing you can be sure of everyone in Harley's family carries seasoning. Harley, Shirley and Susan do a good job of introducing the products to people when they are traveling, leaving samples along the way. That is exactly how Harley's came to be for sale at three different locations throughout Minnesota. Harley and Shirley met John Lind of B & B Market at a cook off many years ago and he began selling it in his store in Cloquet. B & B Market carries all varieties in the 14 oz size. 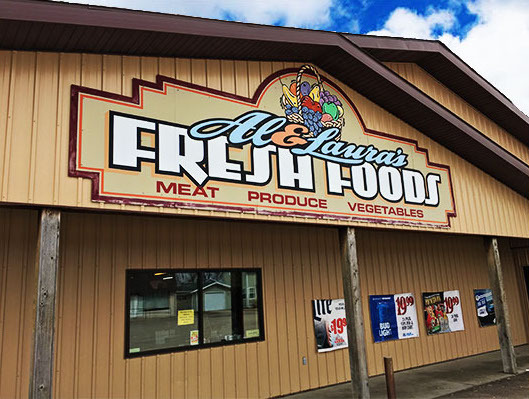 Susan and Chad visited Al & Laura of Al & Laura's Fresh Foods in Fertile while attending a wedding. Ever since that weekend they have been selling the 14 oz size of Original and the Sweet in their grocery store. I asked Shirley about how the relationship started with Knaus Sausage House up in Kimball and she said it was so long ago that she didn't really remember, but she was sure it was at a cook off somewhere. Knaus Sausage house sells all varieties in both 8 oz and 14 oz. in store and online. Stop by any of these stores or visit their websites. B&B Market is located at 506 Big Lake Rd. Cloquet, MN, 55720. Our store hours are Monday through Friday 6:00 a.m. – 9:00 p.m. and Saturday to Sunday 7:00 a.m – 9:00 p.m. If you have any questions or would like to contact us for catering needs, delivery options, or any thing else that may come up we can be reached at (218) 879-3555.